Most people think of legacy as something you leave behind or a benefit that occurs for others after you’ve lived your life. I don’t want to wait until I am gone to create maximum impact- I want to live my legacy while I am here. 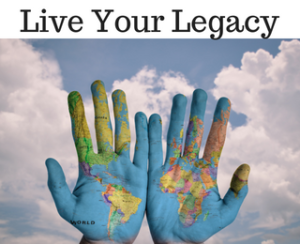 Here a few tips on how you can create your living legacy too. In order to be able to build something, you need to know your end goal. What does it mean to you to create your living legacy? What contribution do you want to make to the world? For you, it may be impacting a huge population by creating social change or improvement. It may also be that your legacy has a more intimate reach with a deeper impact to a smaller group. There is no wrong answer to the question of what you want your living legacy to be. I know many successful people who live their legacy by giving back financially and through programs and content that support people in being the best versions of themselves. My dear friend David Corbin sees the beauty in everyone he meets, and he shares that with others, so they can experience that same beauty. To me, that is his living legacy. No matter what you desire your living legacy to be, start today. Take action, no matter how small. Any step that serves your legacy means you are truly living that legacy now. The longer you can live your legacy, the greater your impact will be. You are not guaranteed any amount of time on this earth. This means that to create maximum impact, you must be living your legacy each and every day that you are gifted breath in your body. Consistency is a major factor for success at any endeavor. A long-lived legacy is built in single actions and moments of legacy. When you wake up each day, be clear on what action you will take to create your living legacy. All great endeavors have been met with resistance. You may experience this as direct feedback from those around you or in the daily grind of a life full of distraction. Living your legacy will be a marathon through both rocky terrain and beautiful meadows. The way you traverse your path is a part of how you create your living legacy. While not everyone is built with an innate desire to be in the spotlight- the best way to create maximum impact is to share your contribution with the world. As I was building the Rich Dad company, I did so without need for personal celebrity. It did not bother me that my partner was the face of the company because I knew that we could not have had the success we did without my contribution. After leaving the Rich Dad company, I realized that as I continued to live my legacy, I would be more effective if I did so by establishing myself as a public figure. Declare your legacy to the world. Start with those close to you- but beware of friends and family that will respond with negativity. Be sure to surround yourself with people that will support you as you create your living legacy. Live a life of integrity as the real you. As you share, do so from the heart, give your gift to the world and you just may be surprised by how the world responds! We all come into this world with the ability to create impact. Whatever you want your impact to be, why wait until you have left this world for it to be realized? You can create your living legacy by taking action and opening up for the world to benefit from you and your contribution. When we are all living our legacy, then we will truly see maximum impact!